A generalized tracheobronchial hyperirritability is a central aspect of asthma. Airway reactivity may vary and with heightened reactivity more obvious and severe symptoms present and more aggressive pharmacotherapy are required. Lung function exhibits fluctuations throughout the day with dyspnea more apparent at night and in the early morning. Airway reactivity varies in all individuals as a function of exposure to oxidant air pollutants as well as following respiratory tract viral infections. Of these two insults, viral infections are more predominant in their long-term effects on airway reactivity. Furthermore, allergens produce rapid increases in airway responsiveness (reactivity) which remains heightened for weeks. With significant allergen exposure, obstruction may occur rapidly and last for some time. The current working framework for the understanding of asthma is based on the presence of continual airway inflammation which can be exacerbated under certain circumstances. Asymptomatic asthmatic patients therefore exhibit the presence of inflammation confirmed by endobronchial biopsy. The airway is characterized as edematous with eosinophil, neutrophils, and lymphocyte infiltration. Increased capillary density with increased cellularity represents probably the most common finding. Overall asthma manifestation is probably a complex result of interactions between airway inflammatory cells, inflammatory mediators, cytokines, and surface epithelium. Cell types most likely involved include mast cells, eosinophils, epithelial cells, and lymphocytes. Also, there is the possibility of macrophage and neutrophil involvement. Cells primarily involved release mediators which include: histamine, leukotrienes (C, D & E), bradykinin, platelet-activating factor, and prostaglandins (E2, F2 , & D2). The above mediators produce an immediate, intense inflammation that is characterized by vascular congestion, edema, and bronchoconstriction. Leukotrienes which act to promote airway smooth muscle contraction as well as mucosal edema also may inhibit mucociliary transport and increase mucus production. 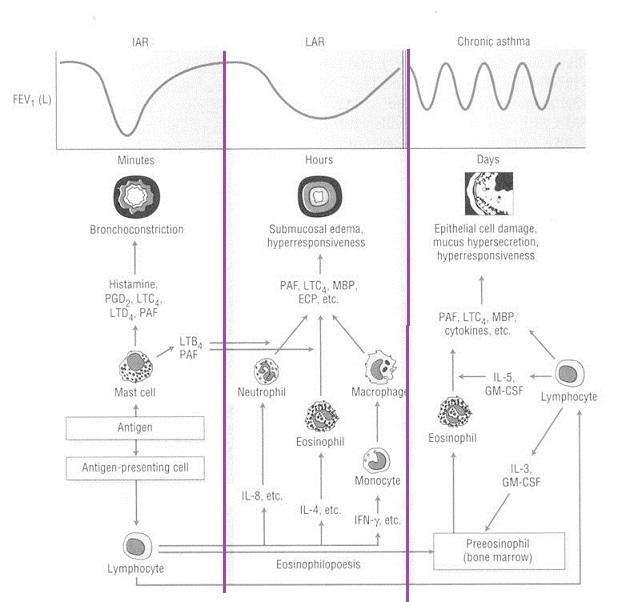 Chronic events follow these initial actions with chemotactic factors recruiting eosinophils, polymorphonuclear leukocytes, and platelets to the reaction site. 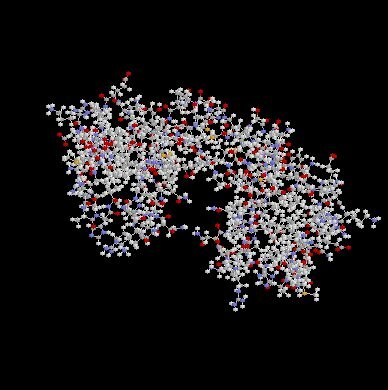 "Chemokines: (chemoattractant cytokines) are short soluble peptides (70-90 amino acids) which can be divided into two groups. Alpha (or C-X-C) chemokines contain a single amino acid between the first and second cysteine residues, and are primarily involved in neutrophil activation. Beta (or C-C) chemokines have adjacent cysteine residues and are generally involved in activation of monocytes, lymphocytes, basophils and eosinophils"6. These chemotactic factors include eosinophil and neutrophil anaphylactic factors and leukotriene B4. These recruited cells in addition to macrophages already present as well as the bronchial epithelium provides sources for additional mediators enhancing immediate and cellular phases. Eotaxin is an eosinophilic chemoattractant cytokine which is upregulated in allergic airways inflammation. Figure below: attribution--Tim Williams PhD, Imperial College of Medicine, South Kensington, London. 8The accumulation of eosinophilic leukocytes in the lungs of asthmatic patients is probably due to the effect of chemoattractant small molecules. Eotaxin has been identified as a potent eosinophil chemoattractants that is produced by several different cells in the stimulated by interleukin-4 and interleukin-13, both of which are synthesized by T-helper (Th)2 lymphocytes. 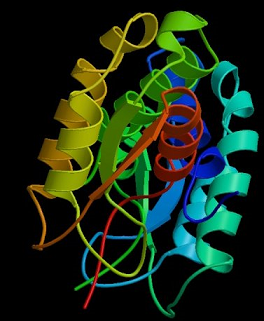 8Eotaxin interacts with the eotaxin receptor which is a C-C chemokine receptor (CCR)3. Small molecules have been synthesized without interfere with eotaxin binding to its chemokine receptor, suggesting a possible therapeutic intervention that will limit eosinophilic recruitment in the lung with subsequent possible prevention of damage and pulmonary dysfunction. 8The eosinophil represents a white cell that has a two-lobed (bilobed) nucleus and has cytoplasmic granules which stain pink following exposure to eosin. It has been suggested that eosinophils are important in the immunological defense system against helminths (worms). Parasitic worms causing immunological response particularly towards TH2 lymphocytes which regulate IgE production. Immunoglobulin E binds to mast cells providing the means for specific antigen recognition (especially important in acute responses to worms). TH2 lymphocytes regulate eosinophil accumulation important chronic responses to worms. In eosinophils accumulating around these parasites then become stimulated to release O (free radicals) molecules as well as toxic proteins including basic protein, eosinophil peroxidase, eosinophil cationic protein and eosinophil-derived neurotoxin. According to this view, allergy may be a host response originally developed against helminths but now triggered in an inappropriate manner by other stimuli. 8Concerning the eotaxin receptor: there been > 50 chemokines identified which mediate effects through at least 15 different 7-transmembrane-spanning, G-proteins-coupled receptors. Most chemokines produce effects by mediation through several different receptors; however, eotaxins are fairly unusual in that there signaling process involves a single receptor, the CCR3 receptor which has been cloned and noted to be highly expressed on eosinophils. The CCR3 receptor has been found also on TH2 lymphocytes which regulate eosinophilic recruitment. Receptor confomrational change which is connected to granule release and chemotaxis. Mechanisms for CCR3 internalization have also been described. 6"The beta-chemokines include RANTES (Regulated upon Activation, Normal T-cell Expressed and Secreted) as well as macrophage inflammatory protein-1 (MIP-1) alpha and beta, and interleukin-8...."
6"Here, the structure of RANTES is shown (Chung et al. Biochemistry 34:9307, 1995). 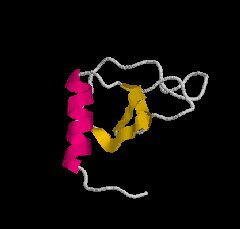 It is a small (8 kDa) dimeric protein that is highly basic (pI 9.5) and which is made up of two identical subunits of 68 amino acids each. 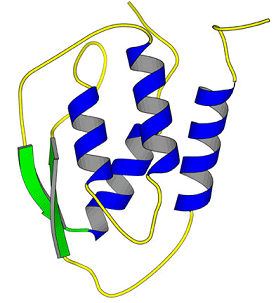 The two monomers are shown here"
Ribbon Form: Three-dimensional structure of recombinant human granulocyte-macrophage colony-stimulating factor. 1 Whereas the mast cell is important in the early stages of the reaction, eosinophils play a central role in the infiltrative aspect. Granular eosinophilic proteins (eosinophilic cationic protein & basic protein) as well as oxygen-derived free radicals probably destroyed the airway epithelial lining medicine and sloughed into the bronchial lumen as 5Creola bodies. 5"Creola bodies ...are characterized... by cilia, the evenly distributed chromatin, and the smooth nuclear membranes"
1 Damage described above not only affects barrier and secretory processes but also causes additional chemotactic cytokine production which promotes additional inflammatory responses. Such localized processes may translate to generalized reactions secondary to activation of neurogenic inflammatory pathways possibly by direct excitation of sensory nerve endings. T lymphocytes are central to the inflammatory response with an increased presence in the asthmatic airway; furthermore,T lymphocytes are activators of cell-mediated immunity through cytokines as well as humoral (IGE) immune reactions. 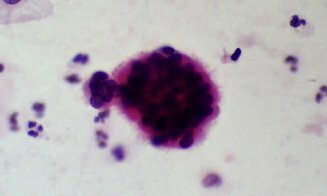 T- activated lymphocytes which have been harvested from asthmatic patient lungs express mRNA for those cytokines involved in eosinophil & mast cell recruitment + activation. With respect to subpopulations,TH1 &TH2 lymphocytes both probably influence asthma responses. For example, cytokines IL2 and interferon (IFN) , Substances Produced by TH1 Lymphocytes promote differentiation & growth of Type B lymphocytes and cause macrophage activation, Respectively. Similarly IL-4 & IL-5, TH2 cytokine products promote B-cell growth and immunoglobulin secretion [IL-4] and eosinophil proliferation, differentiation, & activation [IL-5]. This process is an important, vital component in asthma inflammatory processes. Cytokines synthesized and released from these inflammatory cells discussed earlier as well as from epithelial cells, fibroblasts, endothelial cells, and airway smooth muscle activate many specific cell-surface receptors. IL-4 & IL-13 -- activates B lymphocytes IgE synthesis and adhesion molecule expression. IL-5 -- differentiation and lengthens eosinophil survival. Pro- inflammatory cytokines which also could amplify the inflammatory response include IL-1B, IL-6, IL-11, tumor necrosis factor (TNF- ) and GM-CSF .